This is a technology involving the use of slick water, pumped deep down into the earth at high pressure to release gas and oil from shale rock. Slickwater is water with some specific amounts of ‘proppant’ a sand-like material and other chemicals that help reduce water friction. ‘Fracking’ is a nickname for hydraulic fracturing. Natural gas or shale gas molecules and non-traditional oil can be found trapped in very tiny pockets within shale formations very deep down the earth’s surface (about 1000 to 4000ft below). These tiny fissures can be as small as 1mm in diameter. The process begins with drilling vertically down and then horizontally for many more miles. 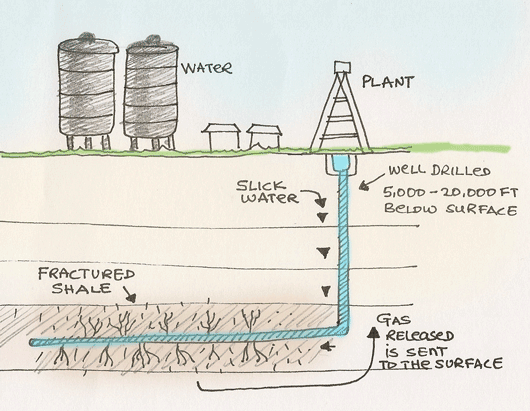 After this, the slick water is pumped in the wells and tiny cracks and spaces in the shale rock are forced to widen. The sand-like materials hold the widened spaces open for the gas to be released and sucked up to the surface. Fracking is a newer technology, compared to the traditional oil and gas drilling. It has become very common in the USA, and many of the natural gas plants use this process. The U.S. government estimates that as many as 15 billion barrels of oil could lie within the formation, but most of it is not retrievable without fracking1. Other countries have also begun using this technology to produce gas. Countries such as Russia, Canada, USA, Mexico Argentina, Australia and China are among the worlds leading shale reservoir locations. There is a major issue with fracking and many environmental organizations have stepped up pressure on authorities to come clean on a couple of things: water scarcity and water contamination. The process involves pumping millions of gallons of water, which is a valuable natural resource, and a very scarce commodity in many places where shale gas has been identified. Even though the USA has no problems with water scarcity, there is the valid concern if the use of fresh water for this process is a responsible thing. Fracking hotspots such as Texas and Colorado in the USA are a concern because these are cities with growing populations, coupled with regular arid and drought conditions. There is also the water table and wastewater issue. Slickwater being introduced into the wells has the potential of contaminating water tables and the like. There is the issue of wastewater that is collected after the process, especially after the extraction, which produces a lot of wastewater. 1. ANALYSIS & PROJECTIONS, US Department of Energy. 3. Hydraulic Fracturing Overview, FracFocus.